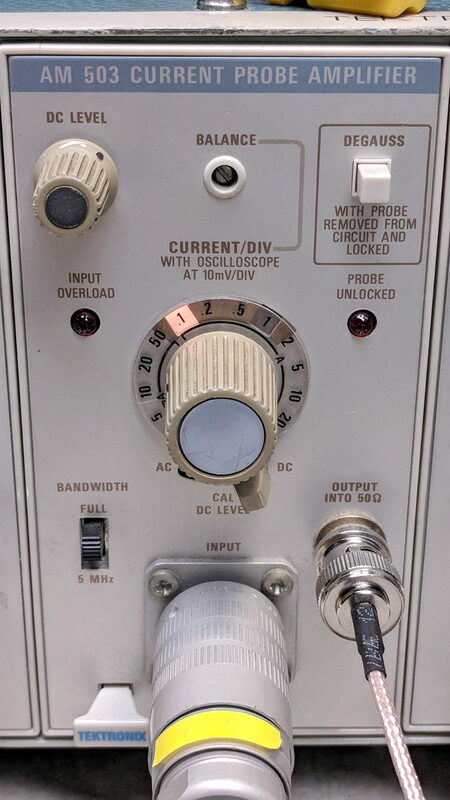 The front-panel knob produced only positive output voltages from maybe 50 mV to the amp’s upper limit around 200 mV (into a 50 Ω termination, Tek not being one to fool around with signal quality & bandwidth). Other than that, the amp seemed to work fine, but you definitely want a 0 V baseline corresponding to no current through the Hall probe. 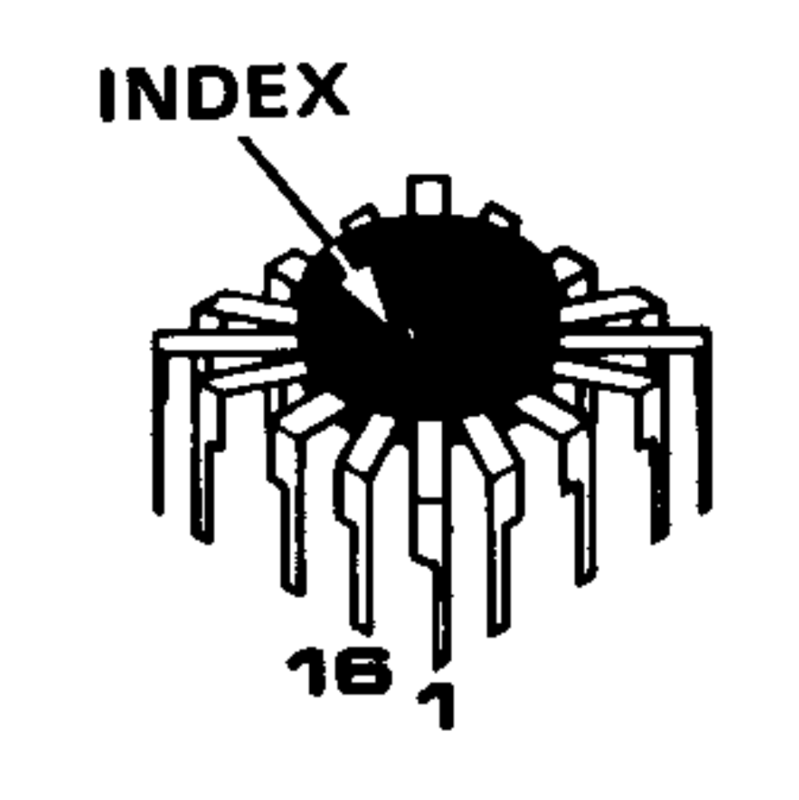 Which puts pin 1 at the upper right corner of the package on the PCB. 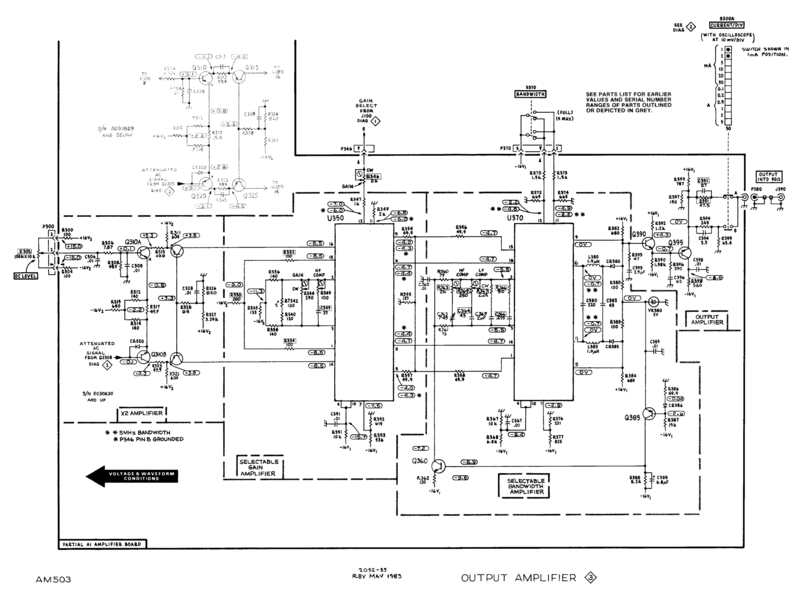 The part listing in the manual says MICROCKT,LINEAR:VERTICAL AMPLIFIER / SELECTED, which makes perfect sense given Tek’s oscilloscope business; if you needed a high-speed differential amplifier, that’s what Tek’s internal catalog would surely suggest. 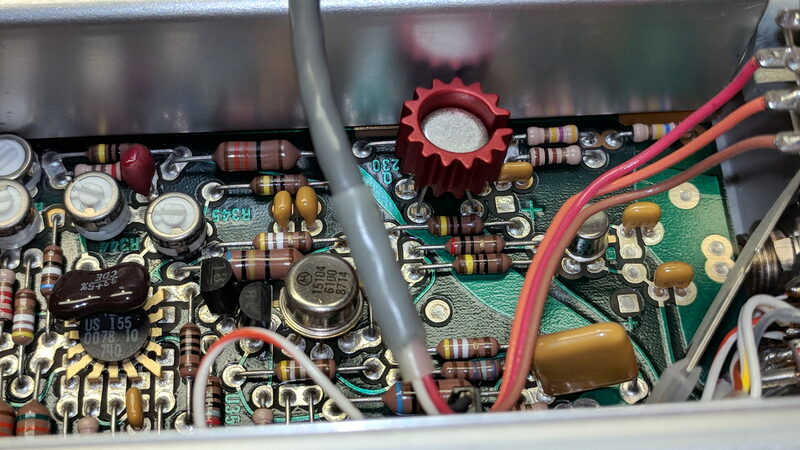 Newer AM503 revisions use somewhat less unobtainable op amps, although they replace the DC Level knob with one of those newfangled microcontroller thingies for some sweet auto-leveling action. Nothing seemed out of order. The unable-to-zero condition pushed the bias voltages off the expected values, but nothing seemed completely out of whack / stuck at the rails / broken. Q230 is clad in the natty red heatsink in the PCB picture above. CR226 is the metal TO-18-ish can partially hidden by the orange-red-brown ribbon cable from the DC Level pot. For future reference, C234 and C244 aren’t installed in this PCB; they’d fit in the conspicuously vacant spots to the right and in front of Q230. What may not be obvious at a first glance: Q230’s pins sit in teeny individual sockets installed in the PCB. 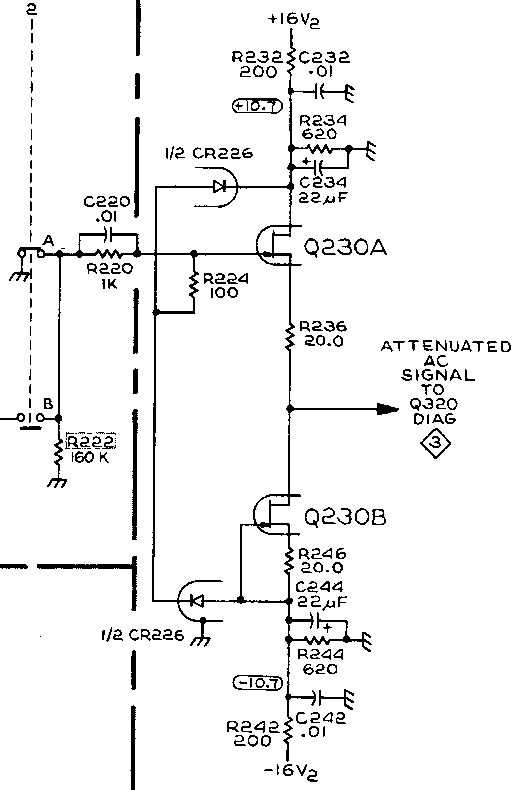 One might remove and reinstall Q230, should one be so inclined and, given that it’s the first active device after the input attenuator, one might imagine such an action being necessary after a catastrophic oopsie. 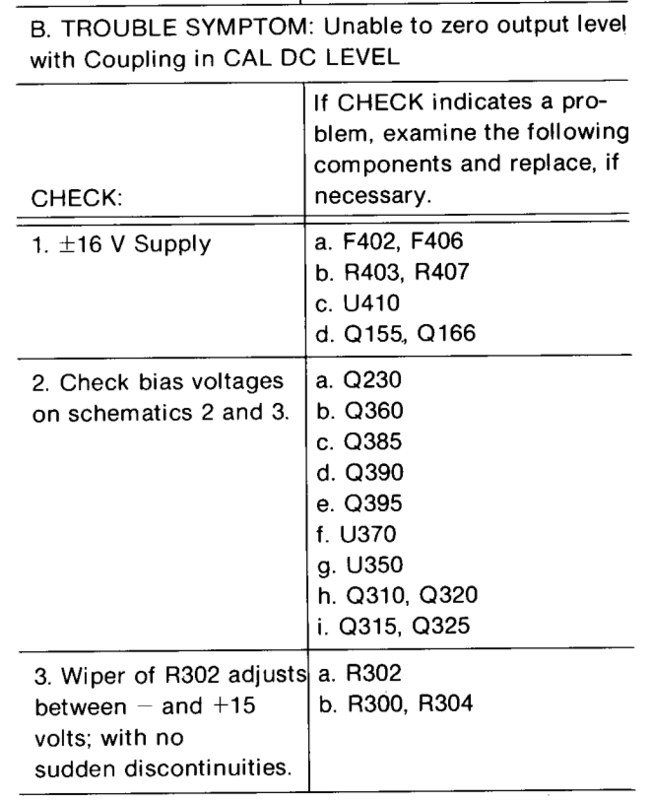 At this late date, finding a suitable dual JFET would be … difficult, even were one were willing to compromise on the hermetic metal TO-78A package. I heroically refrained from pulling it completely out of its socket to dab DeoxIT on the pins; JFETs being notorious for susceptibility to static damage and, likely, lube would make no difference anyway. 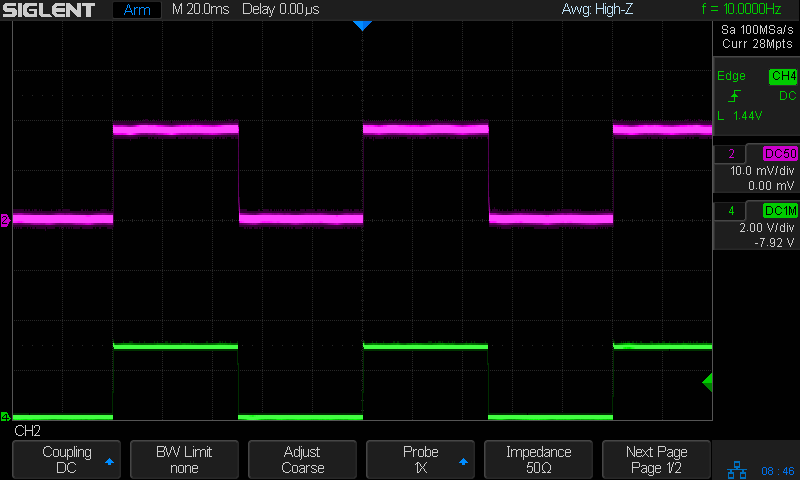 The output now has the usual ±200 mV range centered at 0 V. The waveform shows a 100 mA signal at 50 mA/div, produced by a bench supply into a 100 Ω power resistor switched by a DC-DC SSR. Moral of the story: it’s always the connector!